―Lisa Simpson in brick Like Me. 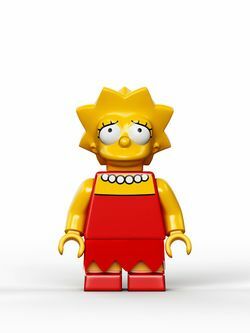 Lisa Simpson is a minifigure released in 2014 as a part of The Simpsons theme. Lisa is Homer and Marge Simpson's oldest daughter. She is known to have so many crushes (From Milhouse, Ralph Wiggum, etc.). Her siblings are Bart and Maggie. Lisa has a new yellow head piece. It is similar to Maggie's, but has a different eye print, hair, and lacks the pacifier and bow. She has a red dress with a pearl necklace and standard yellow arms. She has a shortened red skirt and short legs moulded with red and yellow colouring to simulate shorts and shoes. Lisa is a constant model of good conduct and creativity. It’s a little lonely being the only completely decent and sensible person in all of Springfield, but Lisa does her best. If nothing else, she always has her saxophone and a new political cause every five minutes to keep her company. Lisa Simpson Lisa is a constant model of good conduct and creativity. It’s a little lonely being the only completely decent and sensible person in all of Springfield, but Lisa does her best. If nothing else, she always has her saxophone and a new political cause every five minutes to keep her company.